When I first requested Plain wisdom I assumed it to be another story about the Amish. 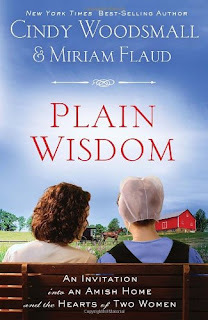 However when I received the book I was excited to see that Miriam Flaud was an Old Order Amish woman who had never written before and that She with Cindy Woodsmall had written about their everyday lives and the things they have learned in Plain Wisdom. The whole time I was reading I felt as though I was sitting around a table with coffee discussing the life stories of two women very much like me! I felt uplifted, encourage and that I also being a believer could relate to both women’s life stories and lessons learned. It was personal! This is a book that I will keep. It is full of recipes and like the title says wisdom! I was impressed with this book and really enjoyed learning about the Amish life and how much believers have in common no matter if we are Amish or a Best Selling author! I received this book for free from WaterBrook Multnomah Publishing Group for this review!